Difference between revisions of "Cuauhtémoc (Chihuahua State, Mexico)"
Cuauhtémoc, Chihuahua State, Mexico, is a town located 120 km (75 mi.) 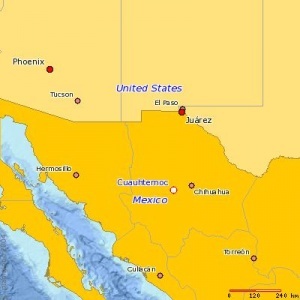 west of the city of Chihuahua (coordinates: 28° 24′ 18″ N, 106° 24′ 0″ W) in the state of Chihuahua, Mexico. The population in 1953 was just under 3,000, composed almost entirely of Mexicans with the exception of foreign-born people who have come there as traders. The town of Cuauhtémoc developed after the coming of the Mennonites in the 1920's although very few Mennonites lived in town, for it was the Mennonite shopping center. A railroad, a highway, and a bus line connected Cuauhtémoc with Chihuahua. In 2005 Cuauhtémoc, one of the fastest-growing cities in Mexico, had 98,725 inhabitants. A four-lane highway, completed in 1986, connected the city with the city of Chihuahua , the state capital. Another highway connected Cuauhtémoc with Col. Anahuac, where a large pulp mill is located. The Gran Vision highway, which is to be continued to the west coast through the Sierra Madre Occidental mountains, joins the city to the western hinterlands, and another highway leaving the city passes through the Mennonite colonies to the north (Manitoba Colony). The apple industry, introduced to the area by a former Old Colony Mennonite, Enrique Wiebe, has contributed much to the rapid growth of the city. The influx of American industry in the mid-1980s, is also attracting people from all over the Republic. Doctors, dentists, and lawyers abound. Elementary, secondary, preparatory, and technology schools are numerous. One agricultural school, incorporated with the University of Chihuahua, is located in Cuauhtémoc, and the one incorporated Mennonite elementary and secondary school, Alvaro Obregon, is located on the outskirts at Quinta Lupita. Although the city, formerly called San Antonio de los Arenales, only developed after the arrival of the Old Colony Mennonites in 1922, it has practically no Mennonites living in it. However, the streets and the numerous banks teem with them, especially on Monday mornings. Cuauhtémoc is the most important commercial center for Old Colony Mennonites in Chihuahua. Fretz, J. Winfield and Helen Ens. "Cuauhtémoc (Chihuahua State, Mexico)." Global Anabaptist Mennonite Encyclopedia Online. August 2008. Web. 25 Apr 2019. http://gameo.org/index.php?title=Cuauht%C3%A9moc_(Chihuahua_State,_Mexico)&oldid=55883. Fretz, J. Winfield and Helen Ens. (August 2008). Cuauhtémoc (Chihuahua State, Mexico). Global Anabaptist Mennonite Encyclopedia Online. Retrieved 25 April 2019, from http://gameo.org/index.php?title=Cuauht%C3%A9moc_(Chihuahua_State,_Mexico)&oldid=55883. Adapted by permission of Herald Press, Harrisonburg, Virginia, from Mennonite Encyclopedia, Vol. 1, pp. 743-744; vol. 5, p. 213. All rights reserved.